Dental implants are often recommended to help restore structure and appearance after tooth loss. Dr. Derek B. Hauser, DDS, has helped transform smiles for 20 years and is passionate about helping families maintain healthy teeth and gums. Call (951) 244-9495 and schedule a consultation at Lakefront Family Dentistry to discuss restorative treatment options. Damaged Tooth From Childhood Needed to be Pulled. Then a Dental Implant Placed, a CEREC Crown, with Professional Teeth Cleaning and Whitening. This patient had two posterior dental implants and two CERC crowns placed on them. 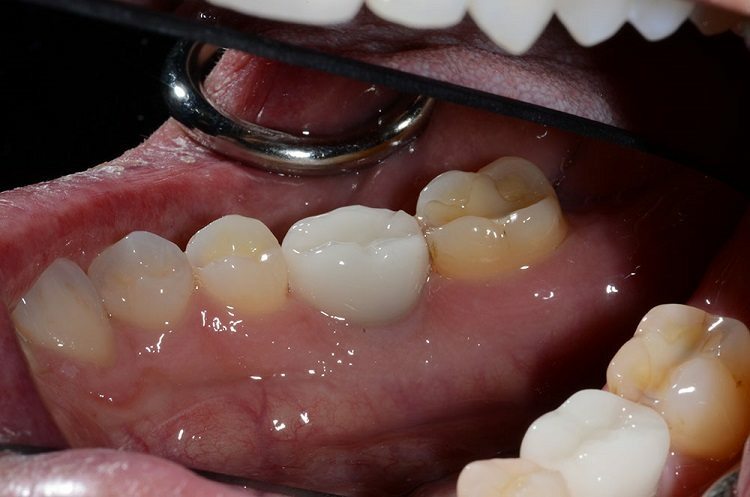 The patient wanted beautiful, white CEREC crowns on them and was ecstatic with the results! Whether a tooth was lost as a result of accidental trauma, infection or gum disease, it’s a serious problem that affects one’s appearance and self esteem. Not only do we need teeth to eat and smile with, but they also help support bone and jaw structure in the mouth. Within one year of losing a tooth, a 25% decrease in jaw bone width will occur. Left untreated, deterioration will continue and can ultimately result in a visibly sunken jaw. A tooth implant is an artificial root, made of titanium, which is placed in or on the jawbone. This root fuses itself to the bone, which helps return stability and stop further deterioration. Once in place, the root also serves as an anchor for a replacement crown or bridge. Lakefront Family Dentistry offers a range of services to meet all your dental needs. Dr. Hauser is a fully qualified family dentist with many years experience adding successful, healthy implants to his patients. Thousands of patients in Riverside County have trusted us to restore their beautiful smiles. Are Implants the Right Choice for Me? This is a great option that can help return a person’s mouth to its normal state. During your appointment, Dr. Hauser will complete a detailed assessment and verify whether or not you are a good candidate for this service. The ideal person for this procedure has a good overall health condition and is free of gum disease. Other medical conditions may affect the titanium root’s ability to fuse to the bone, such as diabetes not controlled by medication, cancer or alcoholism. If any of these conditions exist, Dr. Hauser will make an accurate, professional assessment and then determine which restorative options are best for his patients. Will a New Tooth Implant Look and Feel Normal? Yes, new teeth replacements have a remarkably natural appearance. Dr. Hauser is very skilled at crafting flawless cosmetic restorations that are virtually unnoticeable. Although the implants may look and feel completely normal, they are very different as far as their connection to your bone. Natural teeth are connected around the bone by ligaments, while the titanium root replacement is fused directly to the bone. Also, natural teeth are susceptible to dental caries (i.e. cavities) and decay. The titanium root replacements are made of metal and will not decay or result in cavities, which is great. Yet, implant replacements do require regular care and maintenance, as you would normally do for your natural teeth. It’s important to continue good brushing habits and use an ADA approved toothbrush twice a day. Scheduling regular checkups every 6 months and teeth cleaning will keep your teeth and mouth healthy for years to come. Dr. Hauser trusts and recommends Sonicare products because they help maintain excellent oral hygiene at home. 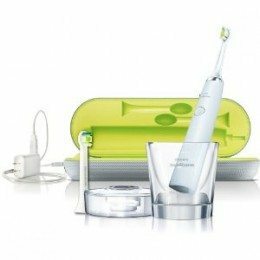 For added convenience, we carry some of the most popular models on the market today, such as the new Sonicare DiamondClean. Our staff can discuss the features and benefits of each model and help you decide which one is best. We are proud to be a leading dental facility in the Inland Empire. Our family friendly staff works hard each day to make sure patient needs are met. When visiting us, we want your family to know they are in good hands and feel completely relaxed. Our state-of-the-art facility features plush seating, premium décor and embodies a calm, welcoming environment. All exam rooms are equipped with the best, top-of-the-line A-dec furniture available to dentists today. During treatment, sit back and relax in premium grade, recliner style chairs that are consistently voted “best in class” by leading practitioners around the country. Because we are a single provider facility, Dr. Hauser is able to establish personal relationships with patients and ensure they receive the highest level of care possible. Whether it’s a routine exam and cleaning, or an advanced procedure such as root canal or gum disease treatment, we are fully equipped to provide solutions you can be proud of and recommend to your family and friends. We also specialize in providing oral cosmetic restorations that dramatically improve one’s physical appearance, which promotes healthy, gorgeous smiles. Our facility features revolutionary technology called the CEREC system, which gives Dr. Hauser the ability to skillfully craft porcelain replacement crowns, bridges and veneers. These products are custom fitted, manufactured and placed…all in one visit. for His Valued Patients Who Enjoy Custom Teeth in Only One Visit! Call (951) 244-9495 and schedule an appointment to discuss dental implants, or make an appointment online with us today. We look forward to giving the best recommendations for your smile and health! Everyone there was so friendly, I knew it was a good sign when I took my initial tour of the office, seeing how happy their patients were. I'm actually excited to come back myself! I like the "Hauser mentality," people spend tens of thousands on cars that they throw away after a couple years. My teeth are FOREVER, I'm going to invest in my smile so I look good, feel good, and they last for the rest of my life. Dr. Hauser and Patti are amazing. The whole staff is genuinely nice and helpful. I used to be so afraid of the dentist that I would never go. Now I go regularly because they understand my fear and do all they can to make me comfortable. They are the best ever! On my first visit, they somehow knew who I was (no signing in required). I barely got a chance to sit down in the waiting room before they called my name... Dr. Hauser himself is great at what he does. It was the first time EVER, that I experienced zero pain.